In the halls of hell, the daemon lords settle their differences like gentleman. Which is to say, they send their minions to do battle for them, with the victor winning honour for its master. The most powerful lords keep stables with hundreds of daemonish minions, monsters bred or just stitched together for nothing but combat. It isn't uncommon for these monsters masters to invent a quarrel, just to see their minions fight! 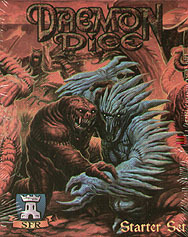 Daemon Dice is a fast-paced game of daemonish combat. As a Daemon Lord, use custom dice to build your daemon and send it into the battle for supremacy in the Infernal Arena. Each daemon breed has its own special powers, or you can mix breeds to gain different edges in the arena, fight until only one daemon is left standing. Collect more starters to build bigger daemons or customize your daemons more.